So... You can see everything in the Screenshot. 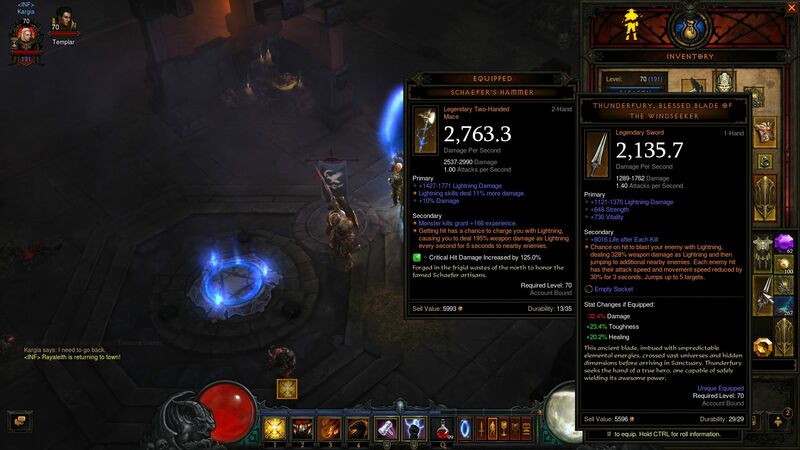 I wonder if despite the dps distance between the two weapon, if it is worth it to play a different crusader. With this 1H with fast attacks (maybe hammers might be more tolerable with fast weapon) or something else. I have already + lightning damage in my gear (http://eu.battle.net/d3/en/profile/Rayaleith-1454/hero/38999265). Any suggestions? You can definitely run everything you are with thunderfury, the proc is insane and even though your paper DPS will decrease a bit (not 32% obviously, the crit gem isnt in there yet) it will be doing more dps than before due to the proc. That has been my experience so far too, in fact I started a thread about my build. I want to say my impressions so far with thudnerfury. - I once again am back to hammers. But this is different. This is a fast one hand weapon. This time I dumped paragon points to attack speed. This is how hammer crusader should be in my opinion. Casting FAST and not with a slow 2H. Especially with the proc. I am so tempted to use again my level 60 Thundergods for the proc. - For life regen I have Life on hit (changed it from Area damage at paragon points) and Renewal since I picked Punish. - Talking about Punish. Judgement + Burst is better damage wise but since I am not playing FoH (fists of heaven) anymore I am not in range so I picked something that might boost my survivability. The downside is that I do not have any ranged attack now and I miss it then when I had to kite a bit. - Renewal is under consideration since I do not use my 20% shield but my 13% one. I will check Fervor tonight. It will do nothing against single mobs but imagine the speed. - Attack speed is so addictive. I really wonder how I would ever switch to a slow weapon. I am so tempted to make a video just to show how fast I get my CDs back when I push Akarat's Champion... I even got TWO bombardments 4-5 Provokes. It is unbelievable. - For fast T1 clears I still find slow 2H + Fist of Heaves much faster for me. T2 is a faceroll at the moment. The pace is fantastic. I still do not like hammers much but at least with this attack speed, it is bearable. I am tempted to try a slash/sweep attack build, but that would work better with fire damage I think. And at the moment I only have magefists.